No offense to the physicists and science enthusiasts who might question the authenticity of this indication, but we all know of the famous theory of relativity. Einstein’s contribution to humanity with this theory needlessly covers not just the realm of science and metaphysics, bur rather wide expanse of human intellect. It is affirmative to realize what it has contributed to the world of physics in general, but the term ‘relative’ in its rhetoric qualities, helps us understand the world in a more palpable manner. What it does is that it allows us to understand the flux and a relative fluidity of life. It allows creating a system in which various components and constants of our expanse come together in one equation. We learn to agree to disagree on matters merely based on believing that everything is relative, inconstant. Through this understanding of relativity gives rise to a set of systems, functions and actions in our culture that run parallel to each other. Each individual associates with one or more systems running simultaneously, that later channels them into proclaiming their preferences, choices, beliefs, mannerisms and school of thoughts. However, it is crucial to realize that often we get so attuned to this individualist approach that we ignore the core of nature. It becomes essential to question the purpose and meaning of these parallel systems in life. Historically art has done something quite similar. Art practices have given birth to beliefs, practices and schools of thought who have in turn fueled more art. Tracing from the cave paintings 40,000 years ago (around 38,000 BCE) till today, we have developed countless systems, beliefs, school of thoughts and movements. Each movement having gained its momentum is energizing numerous sets of practitioners till today. Lending from Kant, Tolstoy, Carroll, Dickie, Danto and many other, art theorists have contributed in providing essential infrastructure to understanding of art. Each theory has been relevant to its time and has helped with the linear progression towards understanding of art situating it within its relevant context. While there are theorists who have commented on the formalistic, contextual, historical, or institutional meaning of the art object, there have also been theorists who have realized the absence of the art object of equal significance. They celebrate the presence of absence. Distinctively the champion of this philosophy John Cage using I-Ching and chance to creating music, pioneered works such as 4’ 33’’ that laid foundations for future conceptual works. His philosophy towards music, dance, and art propelled him to gravitate towards the idea that accentuates a thingness of a thing through the mere absence of the thing. Through these abstract contemplations he created music, dance and art out of everyday sounds, noise and even from silence. 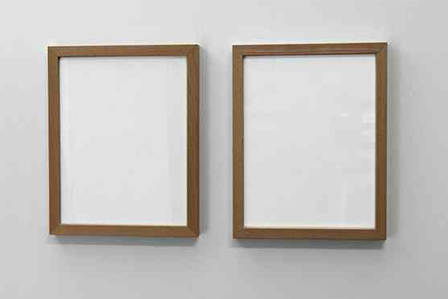 In postmodern contemporary art practices, one sees artists like Yoko Ono, Yves Klein, Andy Warhol, and more recently Lana Newstorm who have created conceptual artwork on invisible art. Artwork that cannot be visually seen, but contrastingly is created through recording the presence of the artist’s body, or through the imagination of the viewers themselves as they stroll inside an empty gallery. The absence of the art object creates art. In retrospect, it becomes quite overwhelming to situate oneself amongst such overarching ideas. Suddenly it seems, that this process of evolution points out a greater threat to a sense of certainty, and with every new development or philosophy one wonders about the relevance of its predecessors. More importantly one asks the most significant question, ‘But, what does this mean?’ We try to understand the meaning of art objects independently, and then also attempt to grasp its impact on the art discourse holistically. 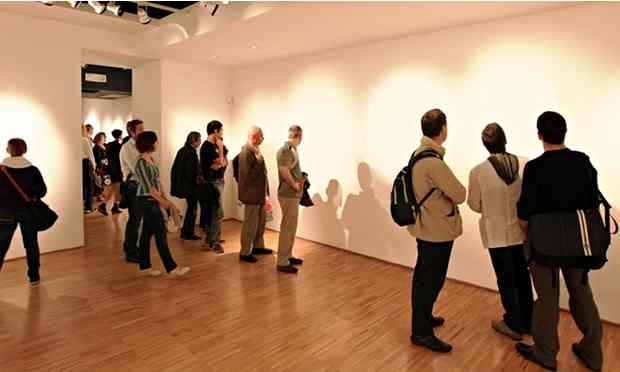 In galleries while marveling through an art experience one constantly finds within a battle of finding meaning to a particular artwork. One often finds solace in adjacent text either in the form of an artist statement or concept statement for the artwork that helps the viewer to navigate and find the ‘true meaning’ of the art. Who gives the artwork meaning? More importantly when does it happen? Is it the artist himself while hidden in the solitudes of his studio, busy in creating the art object finds meaning to the work he is creating? Is it the moment when the work leaves this safe compound off to the cold, light-colored walls of the gallery that they re-discover their true meaning? Is it after a critic sheds his glances over the artwork and through the sharpened qalam pens down the true interpretation of the artwork? It could also not just be an individual rather an institution that elects the true meaning to an art object. The institution may be functioning through a very set pattern or a larger system, critiquing the work based on certain predisposed guidelines or instructions, trying to fit it in a readymade mold. Furthermore, I also find myself asking the question, what is the process of discovering meaning. The most pertinent contradiction that happens during this process is that between feeling and reason. One soon realizes that in retrospect, the debate around meaning is deeply two-fold and perhaps beyond. It demands openness, suctioning towards it a deeply relative treatment, allowing parallel arguments to exist. Is that a fallacious statement? Is it a catch 22? Again what does it mean? If anything this statement is empowering. In contemporary art practices, one finds this statement not fallacious, rather true. In one hand one finds artworks that are cathartic regurgitation, while other times it is created through a very deterministic activism that fuels the thought behind the work, and every component of the work holds immense meaning. There is a huge time dedicated to the process of the work and concept of the installation. Meaning to the artwork is what completes the work. In cases like these the art historians willfully regenerate the meaning of the work and need not interpret further, or read too much into the piece. They take it for granted in a way and forever rely onto the initial notes provided by the artist. But that surely can be easily documented for art created post 1900s, where writers were equipped to readily record the wordings of the artists per sé in print or film. More so it was the artist himself in the mid and later parts of the 20th century that became quite aware of their intentions, and the process of art making was not only an act of spontaneous expression or liberation but also a conscious and mindful one. Also, in the later part of 20th century, one sees the roles of the critics quite christened, and their personal repertoire with the artists functioning as a coordinated appraisal. Soon the critics and writers started dictating the intentions of the artists, operating as their managers and helping them critically navigate through the art market. One wonders how significant are the artists’ intentions in distilling the meaning of an art piece. I also find myself asking the question, does every work have to have meaning velcroed to it? How important is the meaning for the work? Art critics in the mid 20th century, while writing on American abstract expressionists, brought to light the process of painting forward, analyzing the various ways a painter approached the canvas. The act of painting for the first time in history became as important as the work itself. 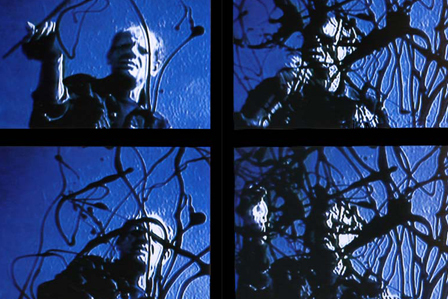 Pollock’s work is positioned crucial in incorporating the body of the artist himself and his gestures as a part of the work. The way Pollock painted, the mere gesture was performative in nature. His approach towards the surface and material was tremendously modern and allowed for the contemporary painters to revise the process and purpose of painting. 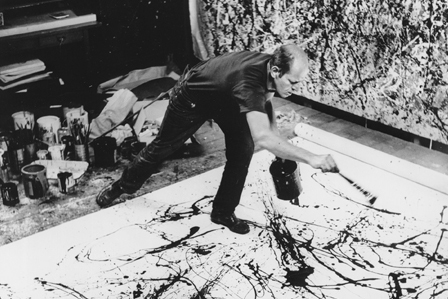 The interpretation or ‘meaning’ given to Pollock’s work is far beyond the scope of his intention. For Pollock was interested in investigating the surface and his relationship to the surface. Pollock’s process of painting was very direct which he discovered by a fortunate accident in the solitude of his studio. The relationship that Pollock had to his work was tremendously personal, in contrast to how it was interpreted and informed art movements in later years. Yves Klein produced painting by using the physical body as a medium to apply paint on the canvas. He used naked models’ bodies covered in paint, dragging them on the canvas as mark making technique. Janine Antonin in ‘Loving Care’ (1993) used her hair as a brush while she dips her head in a bucket of paint and mopped the floor with it. How much of the artist intention is significant in relation to the interpretation or meaning given to the work later? I believe the classical definition of meaning needs to be investigated and perhaps dissected to an extent too. The dictionary meaning of the word ‘meaning’ is “the thing or ideas that somebody wishes to communicate to you by what they say or do”. Through this meaning the intention plays a key role in the process of excavating the meaning of a particular art object. However it is significantly impractical to assume that observation, thought, intellect functions in such controlled manner. According to Kant, the process of appreciating a work of art, there is a certain disconnect one requires to make not just with the intention of the work, but also the personal partiality and preference from within. This may allow one to be able to open up towards the work. It is through this openness before approaching a work of art that one allows the work to expose its vulnerability and position itself to you impersonally. Beyond the progression and system of realizing meaning, meaning is process of comprehending reality. Just how each individual has a subjective version of reality; therefore the individualistic meaning may also. Meaning is a wide expanse. To understand meaning, it would be same as lying under the wide sky at night, trying to count stars that embellish its brim. Meaning is like a black hole, where dimensions are endless and laws and parameters are in constant flux. With every gaining minute, one observes a new discovery, a new construal. Kaprow, Allan. Essays on the Blurring of Art and Life – The Legacy of Jackson Pollock, Berkeley, CA: University of California Press, 1993, pp. 1-9.